The exclusiveness of our tube glass beads lies in their visual appeal, which is offered them by leaf patterns made on cylindrical shape. We create eye lampwork glass beads to our exclusive collections. The usuage of these beads enhancing jewellery & fashion accessories. These beads can be made in any colors but Blue is the mail color to protect from evil Sprits. We pack every item individually in a Polybag. We make all designs in our manufacturing unit. We Have a team of 250 craftsman with excellent quality controller and supervisors. If you want to change any designs with your desire , you can request. Enlightening and decorating the look of miscellaneous items, these lampwork tube beads are used as wonderful add-on. 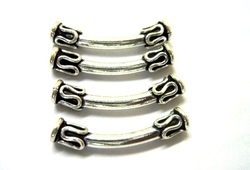 We sell a wide range of tube beads, tube pendants and spacer tubes used for jewel making. These are available in different color finishes and sizesSome of the metal colors that are available are antique bronze, antique silver, antique gold, antique copper and black metal colors. Enjoy shopping with ease. Cash on Delivery available within India. Low min requirement for wholesale orders. 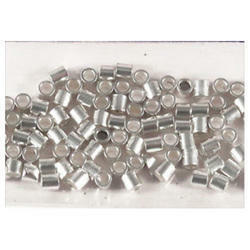 We offer high quality range of Metal Tube Bead. Our range comprises rich elegant style and traditional appearance as well as custom-made piece. This range is very much favored and is used in varied functions. Our range is highly demanded bu the clients.